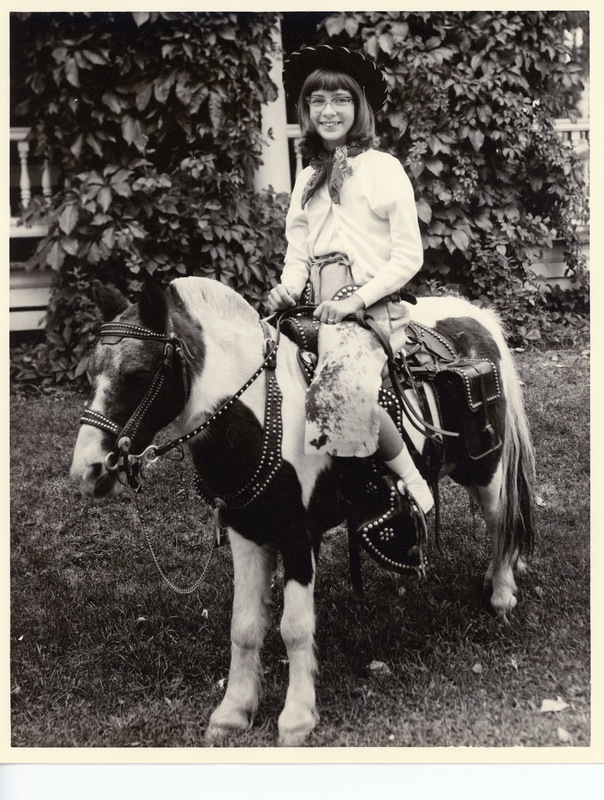 This is me when I was an aspiring cowgirl. Do any of you have pictures like this, taken by a photographer who travelled around with his pony and a set of western duds and took photos of horse crazy kids? I remember hearing the clop of hooves and running to see where the horse was and why it was coming down my street in a town that normally had no horse traffic. I may actually have been whinnying while hunting for the horse. I ran inside and badgered my poor mother until she came out to supervise the shoot, make sure I wasn't being kidnapped, and pay the photographer. We moved to this house in 1961, so I'm guessing the photo was taken in 1961 or 1962. I still shamelessly throw myself at any horse I find (actually, any species I meet, equine or other), despite being stepped on, thrown, and kicked in the chest. I don't think I've ever been bitten. I used to know the names of the police horses in Boston and will never forget the thrill of seeing palomino Cassidy galloping across Boston Common. I'd love to hear from you if you have a photo like this stashed away. Were you bewitched by horses? So today I want to tell you about two terrific ships, both in Philadelphia. They're two of the things I forgot about when I was trying to think of the few things I like about Philadelphia. The first is a story that I hope will have a happy ending. The S.S. United States is the country's flagship, named for the nation. She's a passenger ship, an ocean liner, currently rotting away on the Delaware River in Philadelphia. You can read more about her and see photos of her here: http://en.wikipedia.org/wiki/SS_United_States and here: http://www.ssusc.org/. This is a truly beautiful and amazing ship, one that we, as a country, should restore and be proud of, a piece of our history. She's the kind of ship that looks like she's flying even when she's docked, as she has been for almost twenty years. She's sleek and fast and still holds records for fastest Atlantic crossings. Who else can boast that? Her maiden voyage was in July 1952, a little more than a month before I was born, so maybe she holds a special place in my heart because of that. I don't really think so, though. She's a piece of living history. Restoring her would provide jobs to idle ship builders in the area (Philadelphia still occasionally builds ships) and a restored S.S. United States would attract tourists and make history come alive for bored school children. She could be used for functions, as a restaurant, or for parties, like the next ship I'm going to tell you about. Although I never particularly enjoyed my days as a sailor's wife (too much racing, not enough lying about drinking beer, occasional sea-sickness - please, just put me out of my misery! ), I still love to look at beautiful boats. These are two rippingly gorgeous boats. Let's all take a breath and slow down. I appear to be suffering from blank canvas syndrome. This is my new, blank blog and, oddly, I don't know what to say. I'm not usually at a loss for words, except those that escape me these days. When I stood in front of a blank canvas, afraid to make a mistake with paint, my teacher would take the brush from me and slash it across the canvas. There's no one here to do that, so I'll put down some words and hope that as we get to know each other, things will get easier. You should know something about me. I'm in my very early 60s and grew up in Pennsylvania. But I followed the love of my life to Boston when I was twenty. Jack wisely decided to marry me, and we lived in New England until 2005, when we decided to move back to Pennsylvania to be closer to the three nieces I adore and their growing families. It was an unwise move. We hate Philadelphia. I can think of only three redeeming features: three art-type movie theaters within walking distance, the beautiful Ben Franklin Bridge, and several bar / restaurants with excellent vegan options (thank you, Royal Tavern!). Everyone is busy, so I don't see my nieces often. We talk about moving back to New England, but moving is such a chore. I also wonder if we want to move back to a place we love or if we want to go back to a time when we were happier. I'll try not to dwell on my hatred for Philly, but it colors my world. I love books and reading and, like many of you, I'd go insane if I couldn't disappear into other worlds with frightening frequency. I also love animals and respect them, so I don't eat them or wear them. I spend a lot of distressing and depressing time advocating for their lives. So many people never stop to think about or question everyday actions that have devastating consequences for animals. I have a tattoo of the Sanskrit word 'ahimsa': do no harm to any living creature. I also love fountain pens and ink, blank paper and notebooks, 'The Avengers' (the original British TV series, of course), old mystery movies, silence, old houses, archeology, and bubble baths. I don't suffer fools gladly, or at all. My parents were the best in the world. Even though they died almost fifteen years ago, I miss them more each day. I still reach for the phone to talk to my mother. I have one sister, seven years older than I am. Our oldest sister, Joyce, died just before her second birthday, before either of us was born. I often think about her and wonder what she would have been like and how our lives would have been different if she had lived. My life now seems tame and sometimes dull. I consider that I'm an 'ex' these days: an ex-equestrian, ex-drag racer, ex-gardener, ex-writer, ex-sailor, ex-traveller. I hope to add more exes before I actually exit. That's enough for now. I hope I'll hear from some of my blogging friends and I hope I'll make some new friends. The ice has been broken; let's plunge in!